Kirk Currie's putters have a cult following. Who is he? A Kirk Currie putter is virtually a thing of legend nowadays. Kirk is a putter designer with over 20 years of experience creating designs for major manufacturers and touring professionals. His putters have been featured by major golf manufacturers such as Slazenger and Wilson Staff. Currie was originally an engineer in the oil business. He started making putters after striking up a friendship with a club pro in his native Texas. Such was his skill with a milling machine that he was soon making training putters for touring professionals and over his 20 year career as a putter maker, he's put together a putters for major champions including Jack Nicklaus, Payne Stewart and Padraig Harrington. But his putters have never been the commercial success of the major brands. Kirk specialises in designing custom putters, and in 2007 he brought out his own proprietary line of flat sticks. If you're a fan of custom designed putters such as Scotty Cameron and Tad Moore, then a Kirk Currie putter will right up your alley. Currie is a putter craftsmen who milled putters by hand originally. He belongs in the company of putter designers you hear of every day like Scotty Cameron and Bob Bettinardi, but the great thing is that his putters were always more affordable. Most popular Kirk Currie models? There are two models of Kirk Currie putters that are most sought after by players today. The Brazos model is a blade style putter with a shaft that descends all the way into the head for a completely customisable fit. 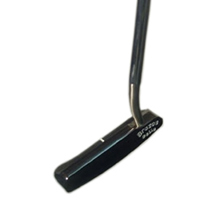 The San Saba model is a mallet head design that features a plumbers neck similar to what is found on the Ping Anser or modern Scotty Cameron Newport. Currie has also designed many popular models for Wilson Staff. These all feature a unique adjustable weighting system that allows you to modify the putter for different green conditions. Currie reportedly left Wilson, however, because he was unhappy with the quality of the finished product, so these are probably putters to be avoided. Many of Currie's early Slazenger designs are also highly sought after by putter aficionados today. If you find a Kirk Currie putter on for sale on eBay, for example, you'll find there are an awful lot of competing bidders. How does a Kirk Currie feel and how do they roll it? These putters deliver a distinct feel that many players describe as soft or woody - similar to the vintage putters used by many of the game's early touring professionals. Kirk Currie putters have a reputation for rolling the ball extremely well - getting it down quickly so that your putts stay on line and avoid skipping off the putter face. What type of putters are they? Some of the really expensive Kirk Currie models you'll find on the used market are custom milled by hand for ultimate quality and performance. The Kirk Currie proprietary line, Slazenger and Wilson Staff line are all 100% CNC milled (i.e. milled by a computer rather than by hand). Some of Currie's earlier designs for Slazenger feature a forged construction that is preferred by some players due to its soft feel. What's so special about Kirk Currie custom fitting ? 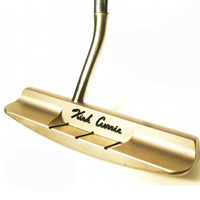 Most Kirk Currie putters are designed so that they can be custom fit for you and your stroke. Many of the designs that he created for Wilson Staff were available in different length and grip configurations, as well as customisable weight combinations. More recent Currie designs be modified from the ground up - from length to loft, lie, weight, and even face balance. 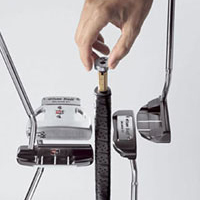 Although many club fitters can now alter putters constructed from soft metals (i.e. anything but a cast head), Currie's fitting system was one of the first to be offered on every putter sold by a particular brand. Are there many tour players using a Kirk Currie Putter? Several tour players are reported to have used putters designed by Kirk Currie in the past, and many are likely still in play today. During part of his later playing career, Jack Nicklaus utilised a Slazenger putter that was designed by Currie and his partner Rick Wright. Not sure whether a Kirk Currie putter would suit your game? Click here for Best-Putter.com's guide to choosing the right putter for your stroke!